According to TMR, the global aircraft seating market will be worth US$27.5 bn by 2026. Between 2017 and 2026, this market is expected to ensure case study CAGR of 12.9%. on the basis of Geography, the market is witnessing high demand in North America. Canada and USA playing a key role in driving the growth of the North America aircraft seating market point in 2017, the market in this region registered revenue of US$3 bn. 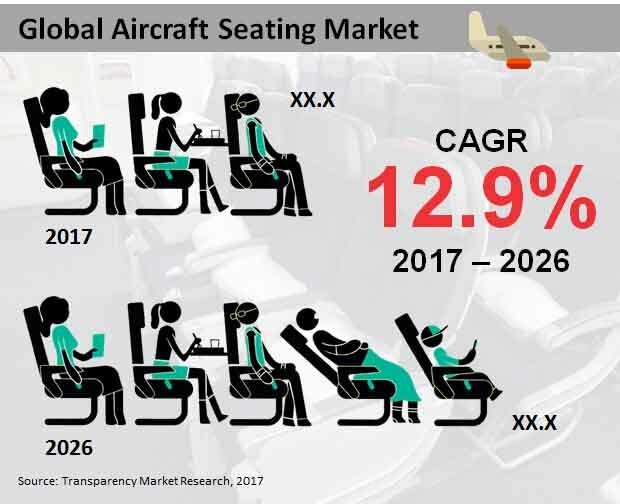 Asia Pacific excluding Japan who will outpace North America and be the largest regional market for aircraft seating, amounting to cross US$9 bn by value. According to the lead author of the report, the demand for narrow body aircraft seats will remain high between 2017 and 2026 as a large number of airline companies are increasingly looking for seats for narrow body aircrafts. Therefore, by type of aircrafts it is a narrow body aircraft which is generating the highest demand for aircraft seating and generated US$6.7 bn in 2017. On the other hand, the demand for aircraft seats for turboprops type aircraft will remain sluggish. On the basis of fitting type, it is the retrofitting segment which will account for 65% of the total market by 2026. Line fittings is expected to witness the sluggish growth. By seating class type, the economy class aircraft seats will lead and register a healthy 13.1% CAGR between 2017 and 2026. The lead author of this report states that, “the demand for aircraft seating is increasing on account of the increase in the manufacturing of new generation aircrafts which are fuel efficient.” The high demand for aircrafts which have enhanced efficiency but consume less fuel and generates less noise is expected to generate a heightened demand for aircraft seating. The growing demand for new aircrafts will boost the growth of the aircraft seating market. The rise in air traffic is also behind the growth of this market. In addition to this, upgradation of aircraft programs will also push the demand for aircraft seating.